The island community continues to grow at an astonishing pace. In October 2016, there were 4 house starts to add to the 29 existing homes on the island. 5 years ago, there were no homes at all. Three full time couples now live on the island beach. And the fourth full time group are the Playa Tesoro staff. One fun loving, full time couple are in the second year of a well run turtle hatchery. Approximately 12,000 eggs are in the sacks hatching that are collected from the beaches of the island. Each night at 5pm, the various renters and owners along the beach gather at the hatchery and see over 200 baby sea turtles be released into the Pacifc Ocean. A real treat. In November 2016, 8 years after beginning this project, we are very proud to announce that the final connections for the Playa Tesoro community water system are complete. Both the Primary water system supplying the development from over 17 kilometer of pipeline, and the emergency supply tank on the Playa Tesoro property are fully operating. The main tank of 20,000 gallons was moved onto its concrete base a few days ago. The emergency tank of 10,000 gallons was hooked into the main line and stands ready for any interuption in supply from the main tank. This is an excellent, private water supply of perfect drinking water. Adding Sign poles and road signs are also part of the road improvement plan to Playa Tesoro Development in Leon. Here is the 2 meter wide road sign on the Pan American highway about 9 minutes south of leon. In November 2016, we are well past half way on the marina project at Playa Tesoro. With the completion of this work shop and boat storage facility, 3 boats, and the operating water taxi we are in good shape to finish up with the dock and slips in mid 2017. In this 16 foot high, 2 bay workshop we will store several boats and operate a motor maintenance service. Road work continues both inside the Playa Tesoro development site and on the 19 kilometer access road from the Pan American Highway. This ongoing program is perpetually in motion, and the drive time to Leon city improves every month. In the previous picture crushed rock is dropped for leveling on a kilometer of the Playa Tesoro roads to allow access for material delivery trucks. This particular road to 30 more beach lots allows construction starts on several new homes and pools in 2016.The lots numbered Tesoro #43 to #68 are on this new road, and a number of river lots. The picture below is the finished road improvement. Every sizeable beach development needs a statement in the front gate of the grounds. 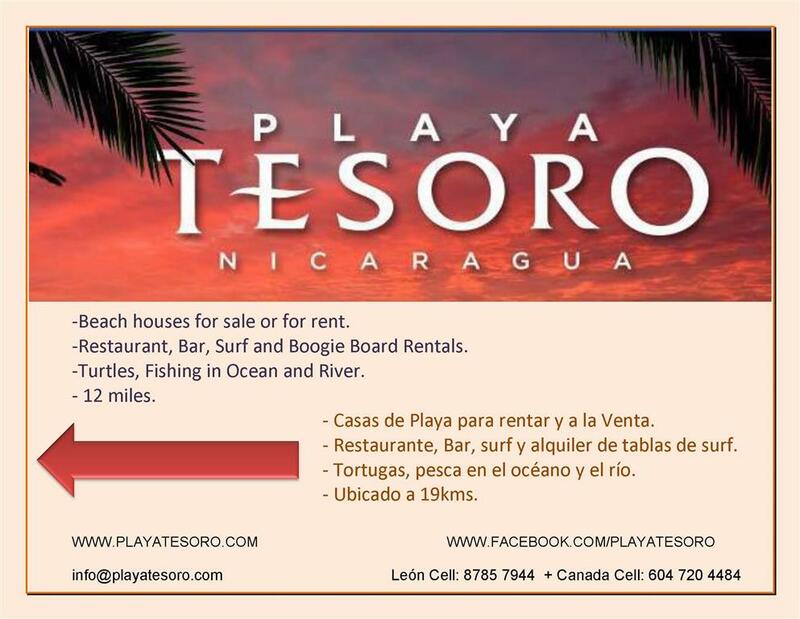 The intended statement at Playa Tesoro is " Welcome to a friendly place where locals and foreigners can mingle and enjoy healthy relationships". October 2016 saw the crew finishing up phase 1 of the Playa Tesoro community entrance wall. The school house in Las Marimbas is a one storey, two room concrete block, structure about 15 minutes from Playa Tesoro in Leon state of Nicaragua. It is about a 1.5 hour drive west of Managua on the way to Leon city. The yellow house at Playa Tesoro on lot #42, affectionately known as Tes #42 yellow, opens for rental booking next month in June 2016. Tes #42 has the development's second swimming pool, whose design is improved. This home also has several subtle design improvements over the earlier homes. The present at Playa Tesoro is a new swimming pool and patio furniture this year!